Egham, 21 March 2017 – OKI Europe Ltd has launched two new wide format Teriostar multifunction printers designed to boost productivity in busy design, engineering and reprographics offices where deadlines are tight and time is money. 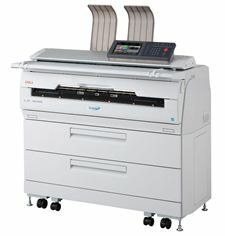 The LP-1040MF and the LP-2060MF print at super speeds; up to 7 A1 size prints per minute and up to 9 A1 size prints per minute, the fastest in their class. Scan speeds of 240 mm per second and parallel processing of tasks also help accelerate workflow and both models feature the industry’s only user-replaceable process cartridges which means projects won’t get derailed by downtime.